Tonight’s dinner is Chelsea Winters Moroccan chicken salad. ( link above ) It is absolutely delicious. Love how her recipes always turn out amazing. And the fact you can prepare many of the elements in the morning ready for quick cook later on. The chicken is marinated with cumin, turmeric, and ground coriander, mixed spice and lemon zest. Grilled and sliced on a spinach/quinoa salad with added capsicums, tomatoes, avocado and topped with toasted pinenuts, strawberries, apricots and a cooling yoghurt dressing. 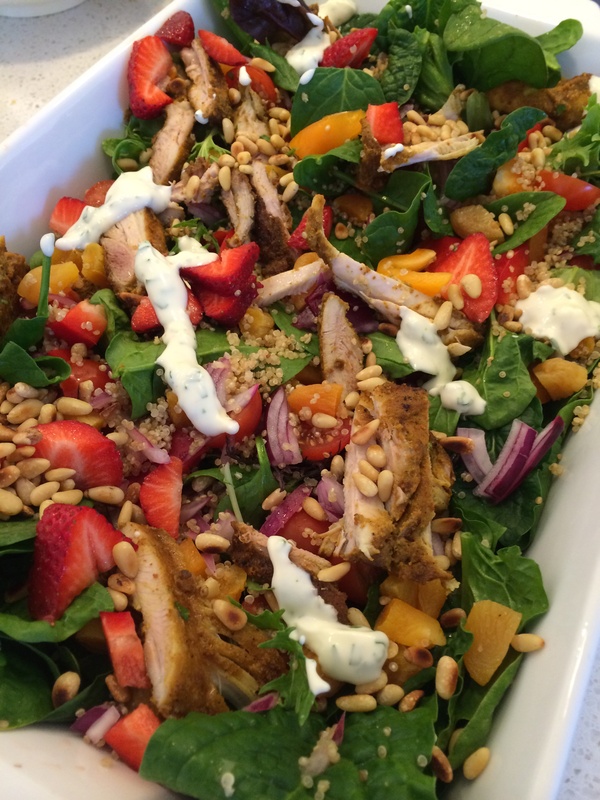 The sweetness from the apricots and strawberries make this salad special. So beautiful , the colours of a mid winter Christmas. Served with baguettes and a carrot and coriander soup from the new Everyday cookbook. Used the Thermomix to cook quinoa substituted for Israeli couscous. (See post above to follow) nb mix the spices first before marinating chicken pieces so they are evenly coated. Got the latest Thermomix cookbook “Everyday cooking for Families” and chip in the weekend and was excited to try it out. Last night tried the guided tuna pasta. As we make meals ahead, the idea of a one step pasta dish seemed like a great idea. But because the pasta is cooked in the TM bowl with sauce, it was shredded into the sauce which was very thick. Very disappointing. Next time I will cook pasta separately in Thermomix and combine with sauce only when ready to serve. With everyone coming at different times pasta definately needs to separate from sauce. 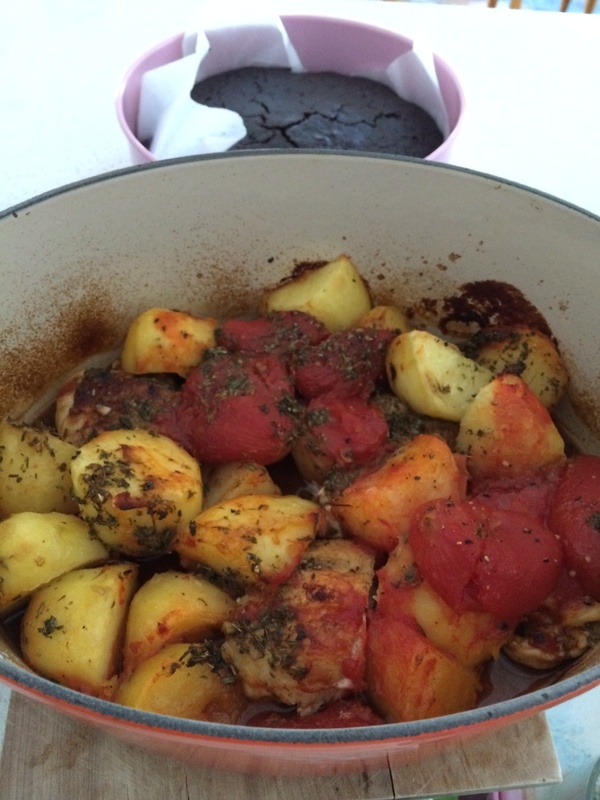 Found this simple recipe from the Thermomix Australia facebook page. It’s one to do if you don’t feel like cooking because it’s less than 10 mins prep time before you set and leave to cook. The only alteration is to add the Varoma to steam vegetables 10 minutes towards the end of cooking the chicken so they don’t get too chopped up. Added some cashew nuts, sesame seeds and salt and pepper and served with rice. It won’t set the world on fire but it’s certainly quick and easy. Similar to Quirky cooking chicken and cashews with coconut satay sauce except her recipe has tamari and ginger instead of honey and mustard. 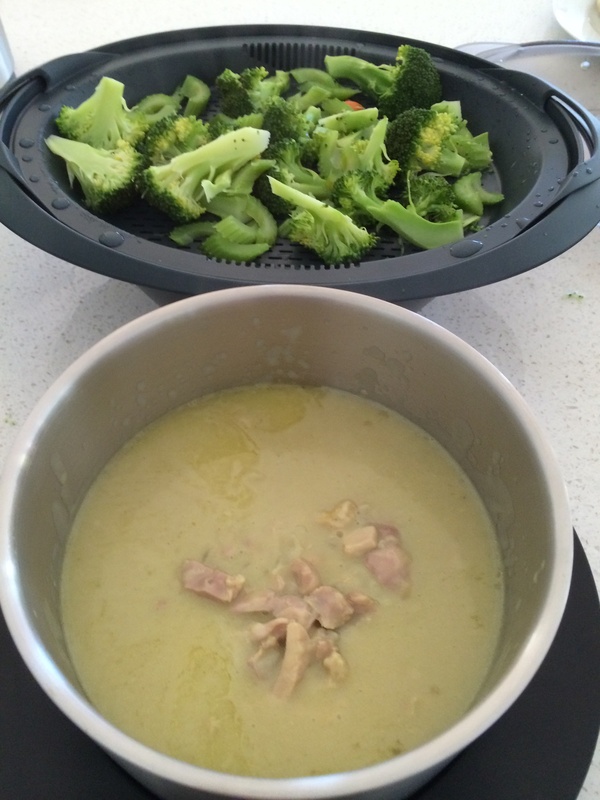 She cooks the chicken, rice and vegetables all in Thermomix at same time. I used a rice cooker to steam rice for the above recipe while the chicken and vegetables were cooking in the Thermomix. The kids love Caesar salad so Chelsea Winter’s Caesar salad was a must try. The dressing differs slightly from Pete Evans family food recipe in that her recipe has a tsp of sugar and basil added. We didn’t have basil tonight but added some italian parsley and extra lemon juice. And instead of 2 eggs yolks in his recipe, hers uses one egg yolk and one whole egg so less whites to use up later. Poached the remaining egg white to add to the salad, then no leftover egg white. The dressing is enough for two huge salads, perfect for our dinner and lunches tomorrow. Add garlic to TM bowl, blitz 3sec speed 7. Add eggs, lemon juice and sugar, blend 1 min, speed 4 until pale. With blades spinning at speed 4, add oil in a thin slow stream to top of lid. The oil will slowly slip into the dressing through the gaps under the measuring cup and should emulsify. Salt and pepper to taste, add more lemon juice to thin or to taste. 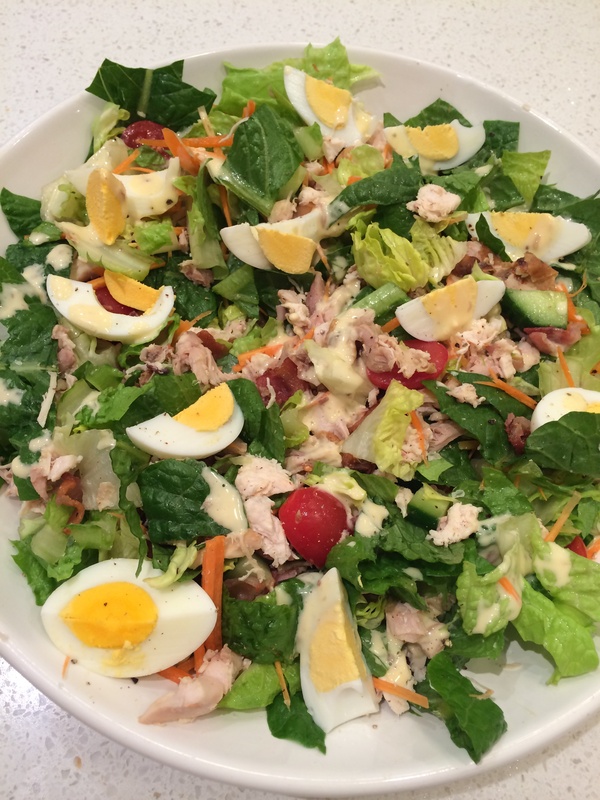 NB:- some handy tips from the above recipe ( recipe community) for chicken Caesar salad, oven baking bacon and croutons together saves time and washing up and steamed honey marinated chicken in Varoma would be another healthy option. 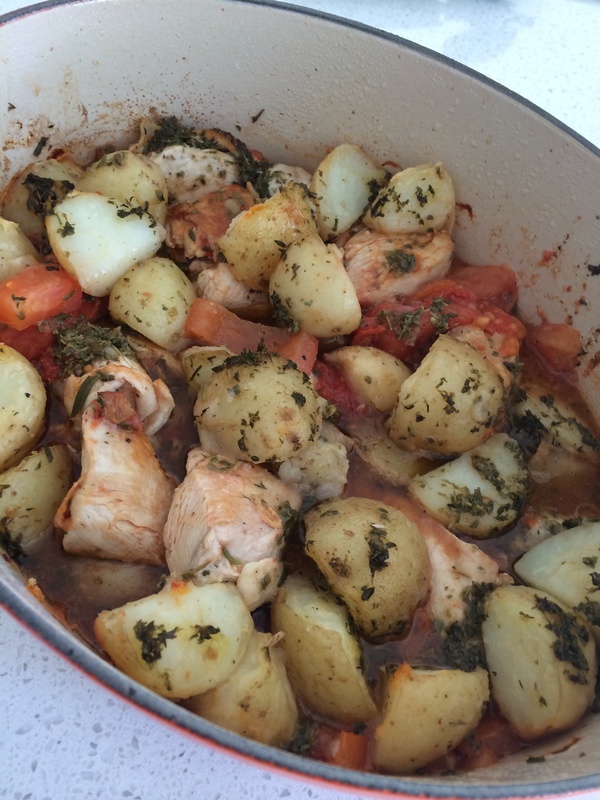 We used a supermarket roast chicken this time. And this was a great dish for getting the kids in the kitchen to help washing, cutting, and preparing all the ingredients. Alternatively to reduce oil content, a lighter dressing to use is her yoghurt dressing which was published on her blog as part of the Lebanese style meatballs recipe or the yoghurt based dressing in the recipe community link above. Chelsea Winter’s Vietnamese Salad dressing. Used Thermomix to make the dressing ; grate a cm piece of ginger (speed 7) as a sub for the ginger juice , then added all the other ingredients per the recipe blitz (speed 5). Marinated some chicken thigh pieces in some of the dressing. Tossed all salad ingredients with dressing and topped with roasted peanuts. 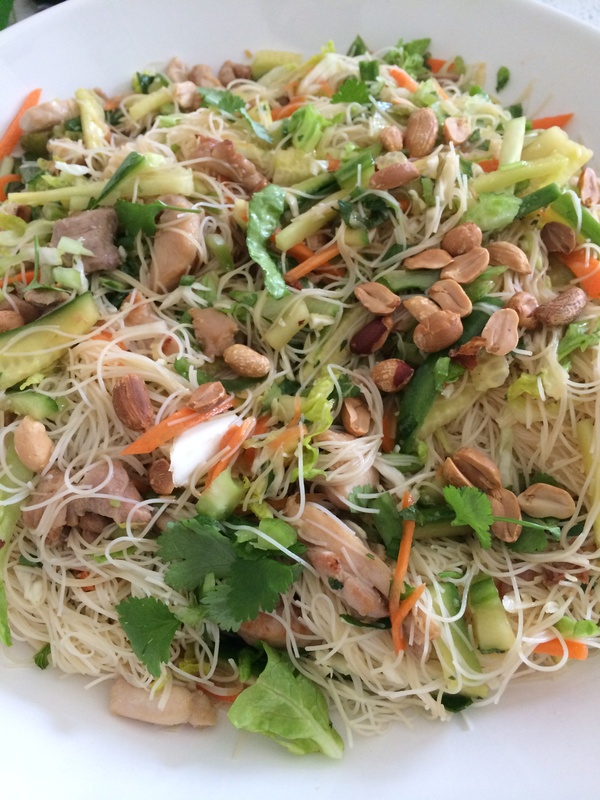 (Can use tmx to coleslaw the vegetables and herbs then add cooked rice noodles and chicken to the coleslaw.) left out chillies and added a little sweet chilli sauce and chopped chillies to adults plates. Delish. 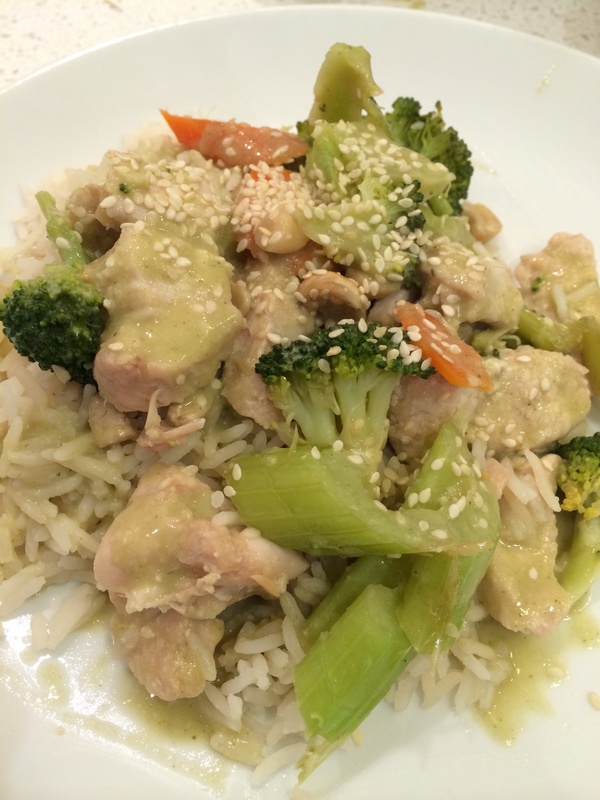 Quirky cooking’s recipe for Chicken and cashew nuts with coconut sauce and coconut rice is a clever all in one recipe that makes a great standard family meal. Uses the Varoma to steam vegetables and chicken while the rice cooks in the bowl. Sauce is made from the remaining coconut liquid in the bowl blended with extra herbs and nuts. Very yummy and enjoyed by us all. Would top with extra roasted cashews next time. Note: use basmati as it cooks quickly in the recipe time and add the chicken stock to the sauce before the final cooking stage.